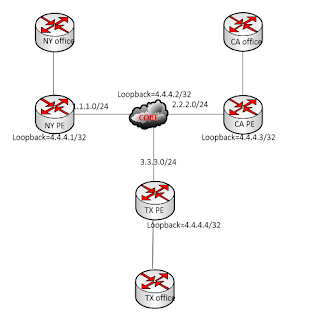 This lab demonstrates how to connect multiple branch offices to the HQ on Mikrotik routerOS, using MPLS with VPLS. One of the requirements that service providers get is to provide transparent connectivity between offices. MPLS forwarding allows service providers to speed up packet forwarding on their networks. The use of Virtual Private LAN Service (VPLS) removes the need for the encapsulation of ethernet frame forwarding in IP, thereby further increasing the efficiency of ethernet frame forwarding. This LAB requires that there should be no hops between all branches. All networks depicted in network diagram will be configured and advertised on the core and all PE routers using OSPF to provide full convergence and reachability among provider edge routers. Loopback interfaces will be created on the core and all PE routers for LDP connection. On PE routers, no IP addresses will be assigned to interfaces connecting to the customers. At this point, we should have reachability to all loopback IPs from all PE routers. Next, we will enable MPLS label distribution protocol (LDP) on the core and all PE routers and add participating interfaces. 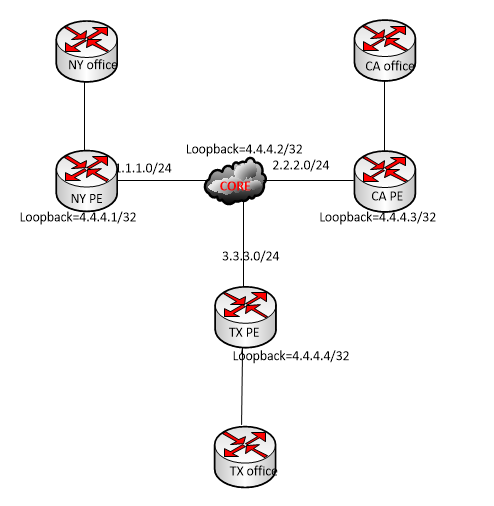 LDP transport address will be set to the loopback address configured on each router. The reason for this is because we do not want interface status to affect LDP neighbor relationship. Also, because we do not want change in addressing should not affect mpls setup. At this point, we have a fully configured MPLS cloud. Next, we implement VPLS mapping to connect branches together. On each PE router, there will be two VPLS mapping to reach two other locations. ← Trusted And Untrusted Source.